You are invited to enjoy Bell + Whete’s snout-to-tail, whole pig cookery and the medieval feasting traditions of the Normans! We will savor a big plate of Roasted Pig, Citrus Chili Garlic Drippings, Seasonal Market Sides and Housemade Bread, everything served on a wooden board. Belle + Whete's talented chef will roast the whole pig in a coal-operated roasting box created for pig roasts by Chinese immigrants in Cuba; it will create crispy skin and fall-apart, tender meat. 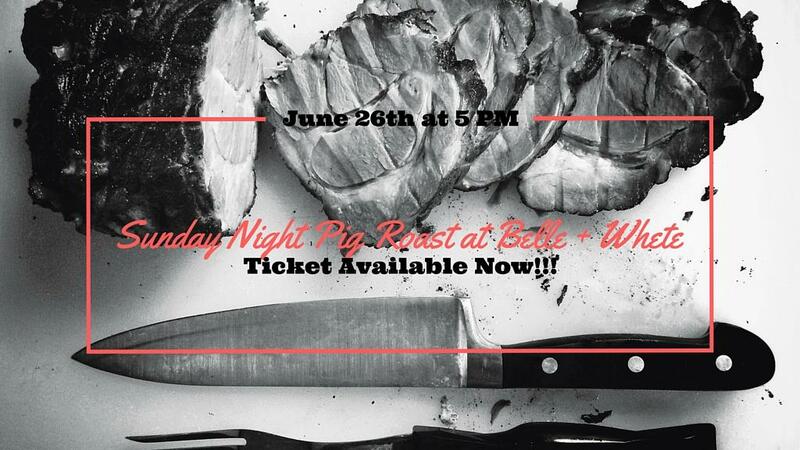 This is going to be a mouth-watering feast and an occasion to hang out and have fun on Belle + Whete's outdoor patio! Tickets include gratuity. See you soon!